The new trading week got started with a bullish bang, but the effort faded as Monday wore on. By the time the closing bell rang, what had been a 0.7% gain was pared back to a 0.12% gain, leaving the market’s true undertow in question. 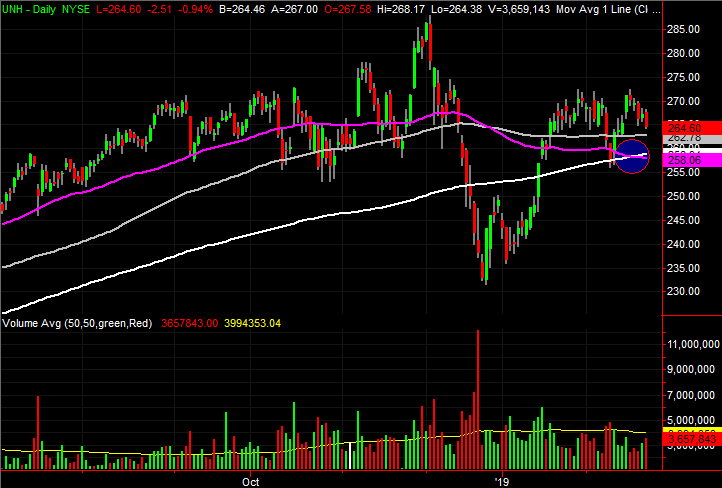 The broad market could have easily ended yesterday’s session in the red were it not for General Electric (NYSE:GE). Shares of the iconic but struggling industrial giant were up more than 6% on the heels of news that it was shedding its biopharma unit for $21.4 billion. Weighing the market down more than most other names was Genworth Financial (NYSE:GNW). The stock lost 6.5% of its value yesterday following news that suitor China Oceanwide’s auditor abruptly resigned. The news raised red flags with investors, even though the impact on Genworth and the impending deal isn’t entirely clear. Neither are great trading prospects today, however. Rather, the stock charts of UnitedHealth Group (NYSE:UNH), Invesco (NYSE:IVZ) and American International Group (NYSE:AIG) are shaping up as your best prospects. Here’s why, and what has to happen next. Like most other stocks, American International Group was pounded pretty severely between October and December of last year. Since then, and even in the midst of the beatdown, AIG has tried to break past an increasingly familiar technical ceiling. It has just never happened. It still hasn’t happened as of yesterday. But, the stock’s increasingly moving to within reach of a break above that ceiling, and as of Monday is in better position to make that breakout thrust than it’s been in months. 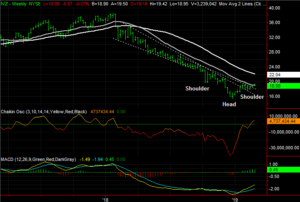 Click to Enlarge • The line in the sand is around $44.60, plotted with a yellow dashed line on both stock charts. Monday’s high tested the area, and though shares didn’t hurdle it, the stock did manage to close above the gray 100-day moving average line with the move. • For the first time in a long time, we’ve seen solid bullish volume more often than not since early last week. 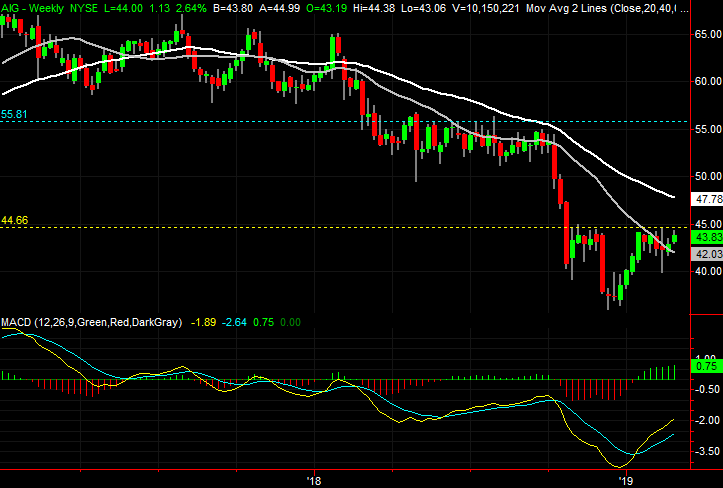 • Should the potential breakout take hold, the most plausible upside target is around $55.80. 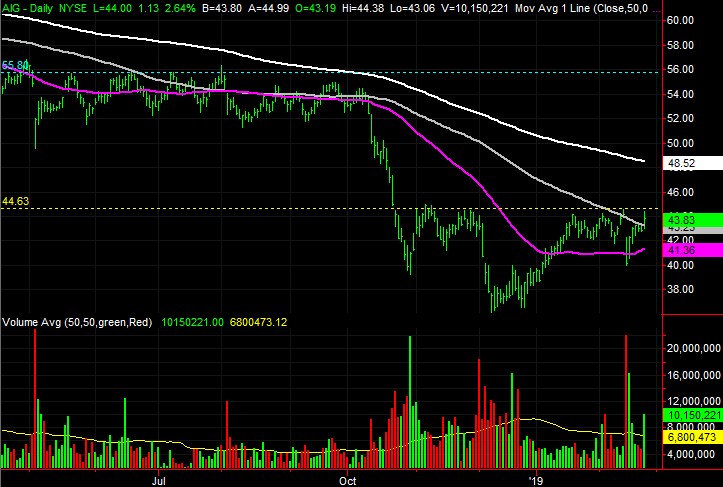 Plotted with a blue dashed line on both stock charts, that area served as a ceiling in the middle part of last year. With just a quick glance, UnitedHealth Group looks to be in reasonably good shape. Though down a little on Tuesday, many stocks were. Last year’s big gain and this year’s big rebound from the December drubbing mean UNH deserves a breather. Take a step back, though, and UNH may be closer to being is serious trouble than it seems on the surface. Knowing that it can take two or three tries to put a new trend into motion, it’s the next setback that could really start to do some damage in the wake of the recent hint. Click to Enlarge • That hint is the purple 50-day moving average line’s move below the white 200-day moving average line. With that so-called “death cross” in place, the next move below the 50-day average line might not end as sweetly as the previous ones have. 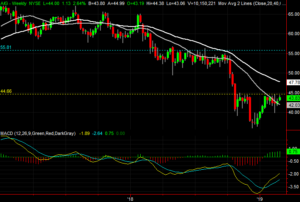 • Zooming out to the weekly chart of UnitedHealth Group, we can gain some much-needed perspective. The runup between 2016 and 2018 was nice, but it also left shares overbought and ripe for more profit-taking. 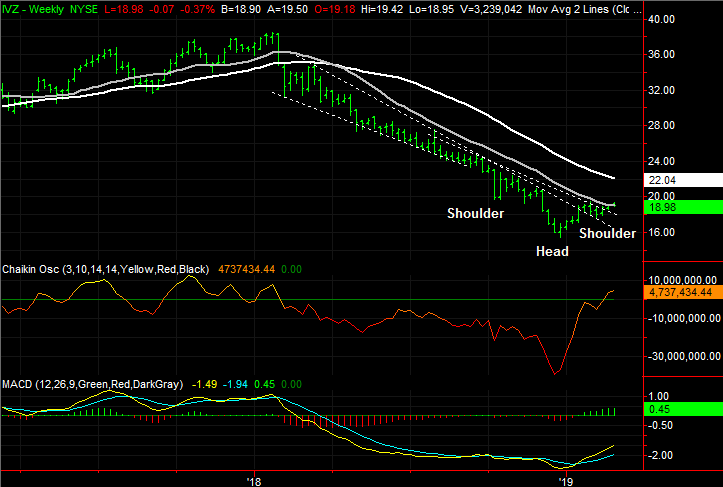 • There’s a subtle hint to that end in the RSI indicator. 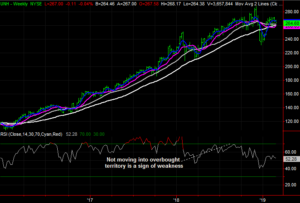 Its bigger trend is still pointed downward after moving into oversold territory in 2017. The buyers haven’t been able to achieve escape velocity ever since. 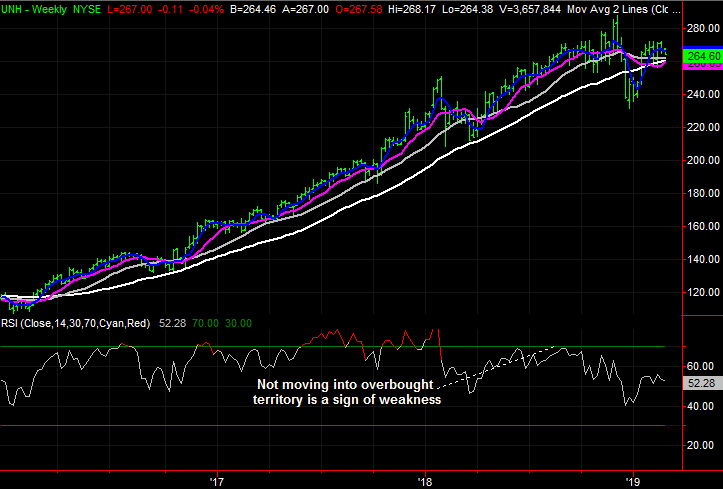 No matter which resistance line you’re talking about, Invesco is above it. That leaves just one plausible ceiling ahead, and it was tested yesterday. Although the bulls failed that test with their first effort, getting a breakout going is more of a process and less of an event. The bulls will get another shot, and the recent action suggests they’ll get over the hump. 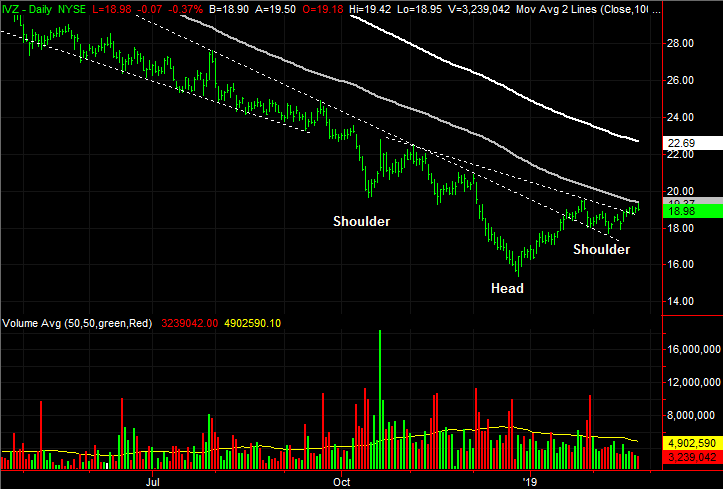 Click to Enlarge • The last line in the sand is the 100-day moving average line, plotted in gray on both stock charts. Invesco shares tested it today, but didn’t hurdle. • Still, all the falling technical ceilings that capped rebound efforts going back to early 2018 — plotted with white dashed lines on both stock charts — are no longer above the stock. • If Invesco can get over that last hump, the odds of a major move are good. IVZ is on the verge of completing an upside-down head and shoulders pattern, which generally signals the completion of an outright reversal effort. Article printed from InvestorPlace Media, https://investorplace.com/2019/02/3-big-stock-charts-for-tuesday-american-international-invesco-and-unitedhealth/.